Today, M Pilar Gil from the Special Collections Division of the library will be giving a paper at the International Symposium Setting their Table: Women and the Periodic Table of Elements in Murcia, Spain. The paper will outline the recent discovery in St Andrews of possibly the oldest Periodic Table and the work that has gone into dating and determining the provenance of this table making reference to the relevance of the Periodic Table on how the teaching of chemistry was done at the time and its links to major Scottish chemists such as Thomas Purdie. This symposium proposes to address the contribution of women to the history of the development of the Periodic Table, which has been so frequently overlooked in the past, and consider the achievements of women in chemistry today. The event will start on the International Day for Women and Girls in Sciences (11 February). More about the discovery of this important item and the research Pilar has carried out into its provenance will be published on the blog very soon. Re: the dating of this periodic table, it is worth mentioning that Thomas Purdie first came to the Chemistry Department in St Andrews in 1884. It was initially to be temporary: as locus for Professor Heddle, but his position was soon confirmed when he was elected third professor of Chemistry in the university, that same year. 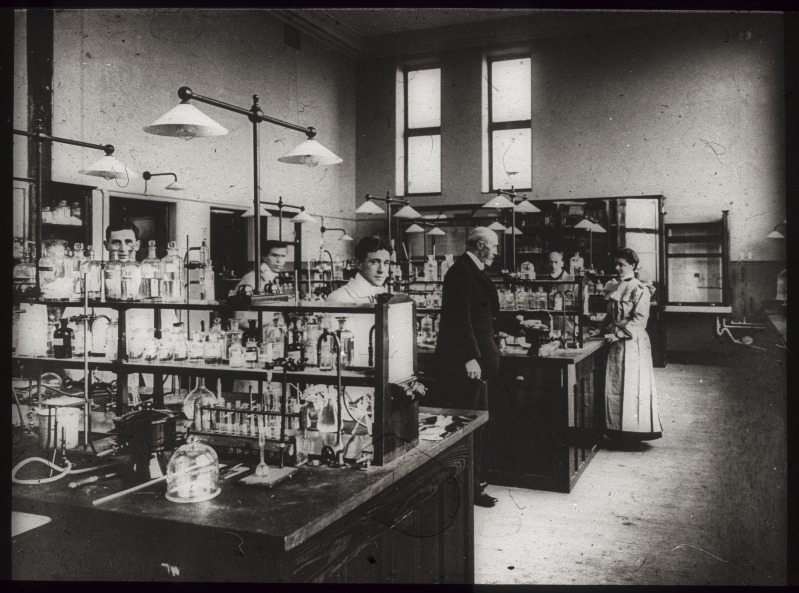 Purdie had trained as a chemist in Germany under Wislicenus in Wurtzburg, and he maintained his connection with German chemists. However, there existed at that time an agency in the UK for the import and purchase from Germany of equipment for chemical laboratories. Purdie had some private means and he increasingly supplied his department with equipment out of his own purse. I think it is highly likely that this periodic table came to St Andrews through the agency of Professor Purdie. It is on record that he found the department poorly equipped when he arrived in 1984. His predecessor, Professor Heddle was an inorganic chemist noted for his long absences ‘out in the field’. I’m so sorry. I made a typo in the penultimate line of the above. It was of course 1884 when Thomas Purdie came to St Andrews. and another typo: – I’m not doing very well today. Purdie was Professor Heddle’s locum! Dear Julia, thanks for your comments and the information. 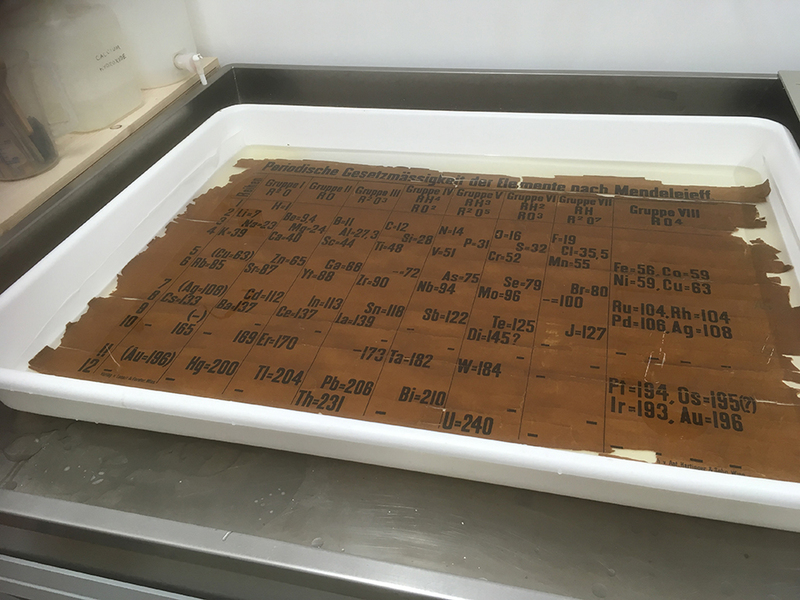 We will be posting soon about the research Pilar has carried out in dating this periodic table which we believe was purchased by Purdie in 1888. More information is to follow.